It also happens to be the name of a tree, of which Olive Leaf Extract is, not surprisingly, extracted. This is glorious for a number of reasons Happy’s, mainly because as humans, we are constantly trying to find a super-ingredient that will make us age slower, and look better. Olive Leaf Extract may very well do both those things. Plus, if we believe everything we read, it might also help us lose weight, and fight sickness, fevers, swelling and even coughs. Hooray! It’s no secret that the healthcare industry is on a bullet train to boom town. Since 9/11, in particular, humans have realised that they do, in fact, have a heart. And they want to look after it. The days of excess, abundance and frivolous spending and eating and consuming are slowly being replaced by thoughtful purchasing choices and a definite embracing of the natural wonders. Which brings me back to Olive. Or, Olive Leaf. With a reported antioxidant capacity almost double that of green tea extract, and 400% higher than vitamin C, it’s no surprise that we’re jumping on board this leafy bullet train with reckless abandon. Add weight loss (due to the phytochemical Oleuropein that can reduce fat stores) into the equation and my guess is that Olive will be knocking Coconut Water off its branch real soon. Suitable for vegans; sugar, alcohol, dairy, nuts, yeast and gluten free, Olive Leaf Extract is a happiness inducing ingredient and is simply slurped up 3 times a day for best results. Water is, quite literally, clear stuff we drink that tastes much nicer with a splash of vodka, or for a healthier option, liquid chlorophyll . 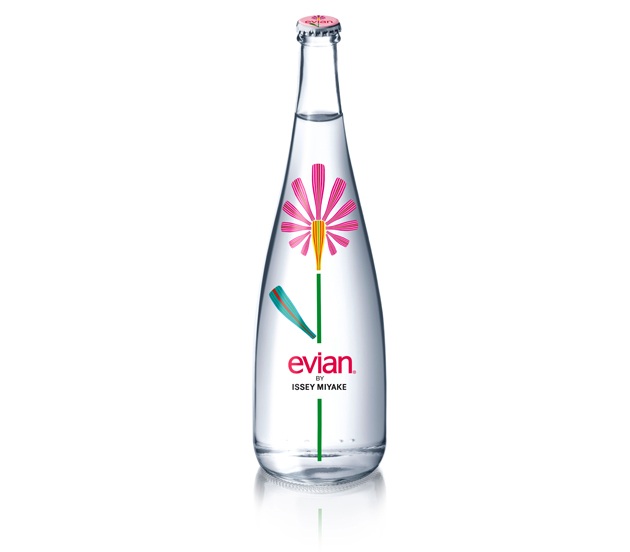 But thanks to our friends at Evian who befriended the creative types at Issey Miyake, there’s a far more pleasant drop to drink that requires no additives at all, save for a dash of fun if you need it. But my guess is that you won’t. There’s enough fun in this delightful bottle to make even the most hardened critic crack a smile, and with an official description that tosses words like optimism, freshness and humour over the net, it’s no surprise I’m loving it. This year, Issey Miyake has designed a very special bottle of Evian water, tying in with the brands collection of pleated clothes. Drawing inspiration for the look of pleats, the bottle is adorned with a delightful array of colour flowers that make me smile and sing and squeal with delight. In a not at all girly way, of course. Who knew water could look so good? Wowza, that was easy. Who ever knew blogging could be so simple? Oh wait, I did of course, because I do it for a living. Yes, by day I write and edit and film stuff on the very fancy beauty website known as PRIMPED.com.au. It’s fun there, you should check it out. The fact is though Happies, I’m interested in far more than beauty. Sure, it keeps my skin nice and glowy and my hair nice and soft, but there’s more to me than that. Lots more. Being jolly and gleeful, for example. This is something I do very well. So it’s here, with my friendly flashing cursor and my crisp white background that I begin to bring you daily dollops of sweetness in the hope to make you smile. And discover. From beauty to health, to food and travel, it’s a concoction of goodness that I hope will blossom. Like sprouts, or flowers. Which brings me to the informative section of this post. Sprouted bread. Have you tried it? 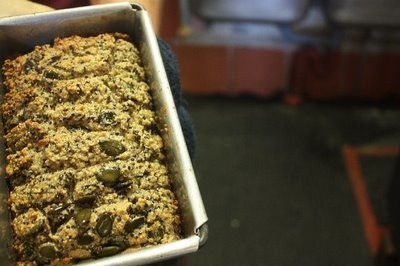 When done correctly, like at my local organic shop, it’s a wonderful option for gluten-freebies and is packed with freshly sprouted grains such as buckwheat, millet and Amaranth. It’s a delicious substitute for regular bread, and if you’re looking to beef up your salad, it’s amazing toasted, and can be used as a garnish on top. Winner! So that’s it, a tasty morsel of fun and happiness, dished up in the form of an introduction and sprouted bread. I look forward to playing with you much more tomorrow, and into the future.